The sage Patanjali, who lived around 200 A.D., wrote The Yoga Sutras, a collection of aphorisms still regarded as one of the most essential texts on the philosophy of yoga. 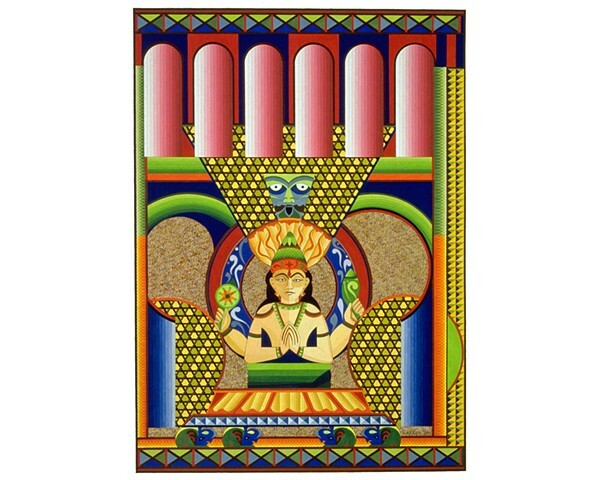 In this painting, Patanjali is in meditation. I first saw him in the form of a small statue, which is the centerpiece of this image. I’ve surrounded him with an environment representing the dignity of ancient wisdom. He is extracting the essence of knowledge so he can put it in written form for the benefit of students like us in the modern world.